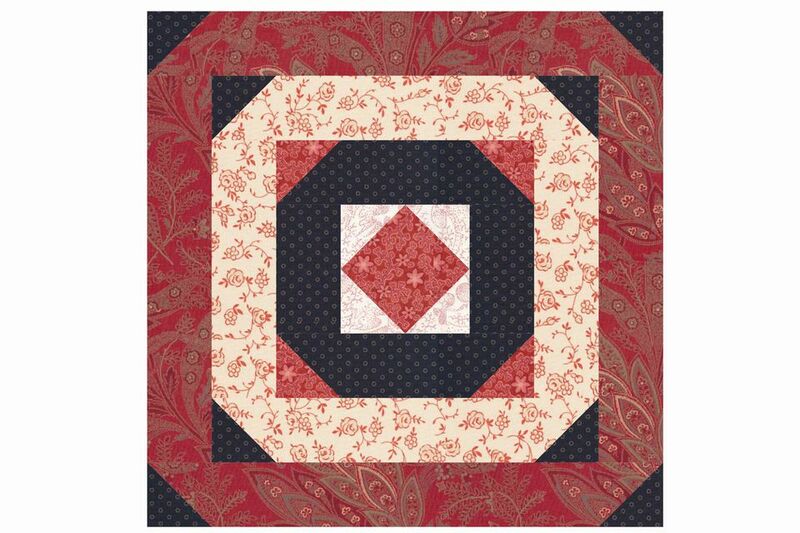 This easy log cabin quilt block pattern is a variation of the traditional design. The quilt block's center is a patchwork unit known as square in a square, and the center is surrounded by groups of logs with triangles where like-logs intersect. In our example, logs in each 'layer' are alike, but you can sew a block that's more like a traditional log cabin quilt block by placing light logs on one side of the block and darker logs on the other. The quilt block finishes at 12" square. I've included cutting instructions for a 16" square quilt block that can be made with jelly roll strips (the center square must be cut from other fabrics). Triangles are sewn to the ends of logs with a quick piecing technique often used for a square in square units, flying geese, Snowball quilt blocks, and many other designs. Choose fabrics to suit the theme of your quilt. This pattern is also a good choice if you'd like to make a scrap quilt. To avoid confusion, keep the squares and strips for each level of logs together. Substitute larger patch sizes for the 16" optional quilt block. Grab the 3-1/2" x 3-1/2" center square and the four contrasting 2" x 2" squares cut for the square in a square unit. Draw a line from one corner to the opposite corner on the back of each small square. Align a small square in the upper right-hand corner of the large square, marked line angled as shown and right sides together, top left drawing. Sew a seam on the line. Set the seam. Trim both layers about 1/4" away from the seam (towards the corner, next diagram). Flip what's left of the small square upright, pressing the seam carefully towards the new triangle (press the opposite direction if the triangle is a very light fabric). Repeat, sewing another small square to the opposite corner of the larger square, left drawing, next row. The square in a square unit should measure 3-1/2" x 3-1/2". Use the same technique explained above to sew small squares to the ends of the two longest strips in each level of logs (two each of 2" x 6-1/2", 2" x 9-1/2", 2" x 12-1/2"). Press angled seams either direction, but take care not to stretch the units. Other than seams sewn on marked lines, sew with a quarter inch seam allowance. We recommend you press to set seams before pressing seam allowances to one side. Follow the illustrations as you sew the quilt block. Sew a 2" x 3-1/2" strip (first level logs) to opposite sides of the square in a square center. Press. Sew the 2" x 6-1/2" strips (with triangle ends) to the remaining sides of the square. Note the orientation of the triangles before sewing. Press. Add the next level by first sewing the 2" x 6-1/2" (plain) strips to opposite sides of the partial block. Press. Sew the 2" x 9-1/2" strips (with triangles) to remaining sides of the block. Press. Add the final round of logs next—the (plain) 2" x 9-1/2" logs to opposite sides first (and press), and then the 2" x 12-1/2" logs (with triangles) to remaining sides. The quilt block should measure 12-1/2" x 12-1/2". Substitute wider and longer strips if making the larger block, which should measure 16-1/2" square after assembly.